The goal of the Eco Travel Network is to offer people in sparsely populated rural areas more sustainable personal transport. Country people can live as sustainably as city folk in most respects, but the low energy of city public transport systems cannot be matched in sparsely populated rural areas. Professor David MacKay, in his book “Sustainable Energy without the Hot Air“, measures the energy used by various modes of transport in “kWh per 100 passenger kilometres”. So, for example, he calculates that an average UK car with one person in it uses about 80kWh of energy to travel 100 km: 80kWh/100p-km. An inter-city coach doing 65mph with 50 people aboard manages 6kWh/100-pkm. A rush hour London Underground train manages 4.4kWh/100-pkm. Most rural commuting trips are, by necessity, car trips, so country people are typically using more than 10 times more energy to get around than their city cousins. Vehicles like the Renault Twizy can change that if they can match the energy per person of urban mass public transport systems. Our Twizy needs 125 watt-hours of mains electricity for each mile we travel with both of us aboard. 100km is 62.14 miles, and 125 watt-hours per mile works out at 7.77 kWh of mains electricity for 100km. This means that a Twizy with only one person in it(at 7.7 kWh/100-pkm) is as energy efficient as a city bus, and with 2 up uses less energy (3.9 kWh/100-pkm) than a rush hour tube train. The battery charging process on a Twizy isn’t 100% efficient, so 1kWh of mains electricity doesn’t put 1kWh of power into the batteries. Nor is the electrical power in the battery converted completely into mechanical power. Renault hasn’t published either of these efficiency factors to my knowledge, but Tesla claim an impressive 88% “wall to wheel” efficiency for their latest Model ‘S’ Sedan. Let us assume that the Twizy manages a more modest 80%. That would mean that every kWh of mains electricity translates to 800 Watt-hours of mechanical energy, and our figure of 125 mains Watt-hours per mile translates (somewhat suspiciously!) to exactly 100 Watt hours of mechanical energy for each mile. To see if these figures makes sense, we can note that a 6kWh battery would take you about 60 miles, and require about 7.5 wall kWh of mains electricity. The Twizy charger requires 2.2 kW at full power, and it should therefore take around 3.4 hours to replenish a completely empty battery. Renault’s published figures for the Twizy are about 60 miles maximum range, and 3.5 hours maximum charge time, so we can be reasonably confident that our assumption of 80% “wall-to-wheel” efficiency is not far off. So what we have in the Twizy is a personal transport system with better energy efficiency than a regular bus, and when carrying two people better energy efficiency than the tube. 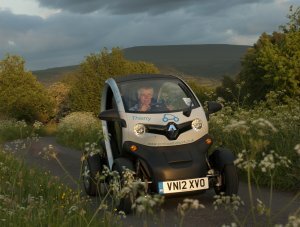 Interestingly, it is also good for about the same journey length one would typically make for a commuter trip, so vehicles like the Twizy can make rural personal transport as “green” as urban mass transit while offering many of the same conveniences as the most popular form of private transport, the car. This entry was posted in Technology and tagged battery, David MacKay, efficiency, Renault Twizy. Bookmark the permalink.